Is Bad Morale Causing My Facilities High Turnover? Bad morale may not appear as obvious in your company as it does in the movies, but there are still signs that disgruntled employees have issues with their workplace environment. You need to spot these indications before they become a severe problem. Only then can you make management adjustments to reduce the impact of high turnover among employees. Here are some tips on how to recognize bad morale and nip it in the bud. Sign #1: Your employees could use an attitude adjustment. You’ll know the signs that your team isn’t happy. They’re showing up late, acting lackadaisical when working and they exhibit negativity. You don’t know the reasons behind it, and that’s a big part of the problem. Tip: Open the lines of communication. If you’re not regularly checking in with your employees, you play a role in why bad morale exists and it leads to high turnover. It’s essential that you schedule time with every level and department within your organization. Encourage them to interact with you and give your input where it’s most needed. Sign #2: Personnel have serious problems with initiative. You may not notice right away when your employees aren’t applying themselves, but your company revenue will. When they’re suffering from morale issues, your team isn’t inspired to do their job. They don’t give their full potential and you don’t reap the benefits. Tip: Organize team building activities to motivate them. Think outside the box and you won’t fall into the kitschy, tedious corporate retreats of the old days. Company activities can be a big part of bringing your employees together to realize a common goal, and they’ll have a fun time doing it. Don’t expect great results if you try to make their efforts directly work related. Instead, look to other sources of interactive entertainment where everyone plays a part. Sign #3: You feel like you’re micromanaging. There’s nothing worse than having to look over the shoulder of every employee, and they feel the same about your heavy handed involvement. When you can’t allow management and your team to handle certain operational matters, you’re not spending your time where it’s most needed. You can't expect significant results from your workforce if you don’t demonstrate trust. Tip: Show your team respect and they’ll manage themselves. Delegation is an acquired skill, but it’s essential when it comes to managing your employees. You need to identify those individuals who show promise and have the abilities to empower others with the tools they need to excel. Make sure to implement a process that allows you to keep a watchful eye, but free yourself to run your business. Sign #4: Employee performance is generally poor. They’re not motivated, so there are many opportunities for your workforce to let things slide. Whether it’s overlooking facility safety measures, failing to properly staff the workplace environment or allowing corporate standards to fall by the wayside, it’s a problem. Implement an award or recognition program for exceptional achievements. When you appreciate their efforts, you need to show it in ways beyond the paycheck. There are many other opportunities for employee incentives that don’t require you to open the wallet, so consider other options. Gift certificates for spa experiences, fine dining or vacation vouchers go a long way. High turnover among your employees has significant effects on your company’s bottom line, so it’s important to detect the factors that cause them to leave. 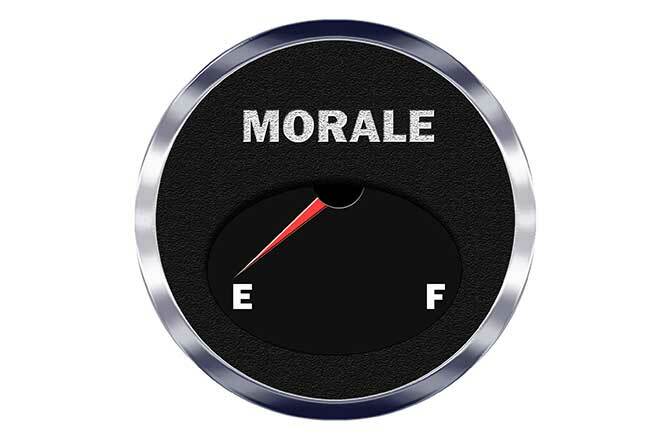 Bad morale is one of the most problematic indications that your personnel are unhappy. Recognize the signs and implement solutions to avoid high employee turnover before it hits your company hard.